'Cliff's Hanger' is a beautiful, log cabin home located 4000' high in the Great Smoky Mountains near Cashiers, North Carolina. 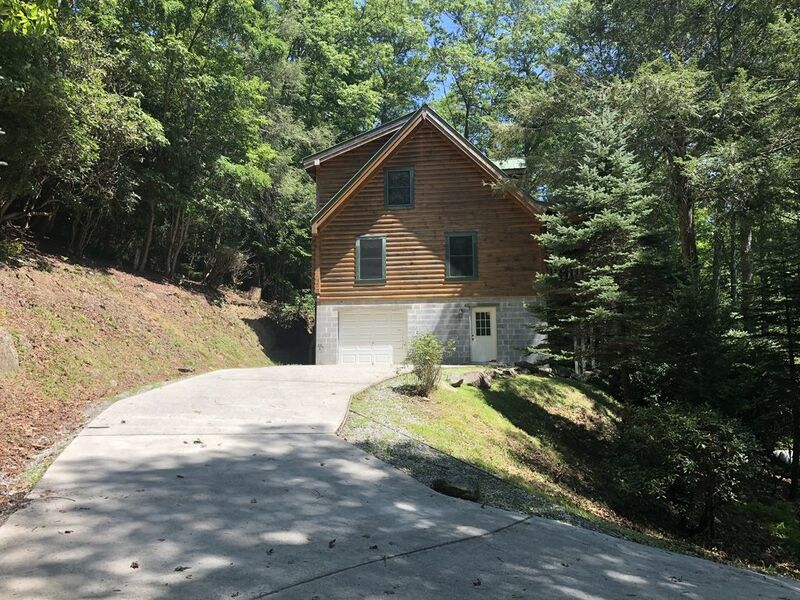 Three miles from Lake Glenville and Trillium Golf Course, this luxurious home is in a private community convenient to Nantahala National Forest, waterfalls, hiking and horseback riding, or shopping in nearby Highlands or Cashiers, NC. Other nearby attractions: Tubing down the Tuckaseegee River, visiting Cherokee Indian Reservation; outdoor play 'Unto These Hills' ; Harrah's Casino; riding the Smokey Mountain Expressway, a visit to the Biltmore Estate; Boat on Lake Glenville 10 minutes away.. In the winter we are 45 minute drive from Cataloochee Ski Resort. Amenities: Fully equipped kitchen including dishwasher, microwave, toaster, coffee maker, refrigerator icemaker and all dishes, pots, pans and utensils, 1satellite TV with VCRs, ceiling fans, telephones, washer/dryer, gas grill, stone gas fireplace, large porch with swing and rockers. queen beds in bedrooms, Plenty of quilts and blankets for those wonderful cool nights!! Activities: The cabin is located 3 miles from Lake Glenville and is close to Trillium golf course, Tuckaseegee River, a local 'Swimming Hole' off Hwy 64, Cherokee and all its attractions and shopping in Sylva, Highlands or Cashiers! It is close to horseback riding, shopping (especially if you like antiques and crafts), white water rafting, tubing down the Tuckaseegee River. There is a full bathroom on all 3 levels of the home. In addition to fireplace, electric baseboard heaters. Cozy living room with fire place, TV, and high ceilings with loft and dormer windows. Flat screen HD TV with DIRECTV service. Elevated front balcony with a beautiful mountain view and equipped with porch swing. Just minutes from the picturesque Lake Glennville with available boat, kayak, pontoon boat, sea-doo and canoe rentals. Also, close to local tubing down Tuckaseegee River and Deep Creek. Elevated front porch/balcony with a beautiful mountain view and porch swing. Several options for skiing, snow tubing, and snow boarding a nearby at Sapphire Valley, Cataloochee, and Maggie Valley. Several options for golf in nearby Sapphire Valley. Swimming and Boating 10 minutes away in Lake Glenville. We had great time exploring the area. The house was nice and clean. We loved swinging on the front porch and enjoying the view. The only complaint was the mattress in the master bedroom was a little to hard for me, but I was still able to sleep. We would highly recommend this house to friends and family. This home was extremely clean, spacious and well stocked! It had everything we needed for our stay. Add to that the beautiful porch to sit and enjoy the Mountain View and we couldn’t have asked for more! Great place, comfortable, quiet, well equipped and maintained. We had a fantastic, family time at the cabin, played cards and games. Once you got used to the winding roads, it was easy to get up and down the mountain. I'd definitely like to return some day. Everything was perfect. Looking forward to the next visit. This is the second time we've stayed at Sandy's house. It's a nice, fairly comfortable house way up in the woods, beyond Lake Glenville. It's a little far from Cashiers and/or Highlands, but it's a pretty drive to either place. The house is situated up a nice, wooded, private neighborhood drive. The big back porch has a lovely view of the woods & mountains. There's like zero light pollution, so if you lean way back on the back porch, you can see just a ton of stars. The kitchen is fine. Everything works. The living room is nice and comfortable. The master bedroom is a decent size, with maybe a queen sized bed? It was comfortable enough. The main floor bath has a great tub with a hand sprayer, but no shower. There are showers in the "basement", and upstairs; though the upstairs shower had poor water pressure last time we were there. We didn't try it this time. It's all nicely decorated, and could easily fit a whole family with two sets of bunk beds in the basement, and another bedroom and a den with a couch upstairs. And the place is well cleaned. The are very few "cons" - You have to take your garbage with you, which is minor. You make your own bed on arrival, which is not bad, except the fitted sheet had shrunk a bit, and took both of us wrestling the mattress to get it on. Clearly I'd go back again, because I already have. It's a nice place. The cabin is centrally located to easily access Sylva, Cashiers, Franklin and Highlands. It is close to Lake Glenville, Trillium Golf Course, Tuckaseegee River and all the scenic falls off Hwy 64 on the way to Highlands. ......so close......yet so far away! From $500/week Rates are for a party of 6. There is a $10/person/night extra charge for parties over 6. Maximum 8. $200 Security Deposit $85 Cleaning Fee There is a $10 person/night charge for parties over 6 Monthly rates consist of 4 weeks. $100 Pet fee (nonrefundable) $200 security deposit refundable after 3 weeks after flea inspection if you have a pet.